This Paneer cutlet is mostly made in our home for the kids after school as . 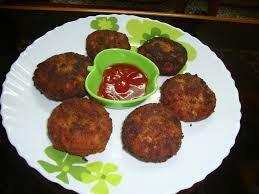 It can be evening snacks and used as a patty for vegetable burger .I have never tried this deep frying. I always prefer to bake them or shallow fry. I usually use bread crumbs for the outer layer, it gives a good crust. This makes a good after school snack or as a part of the lunch box.